Rooftop solar power generation systems should be equipped with structural lightning protection systems and current and surge arresters to ensure long-term operation. Photovoltaic (PV) systems are fast becoming an integral part of many electrical installations as self-generated electricity is cheaper and provides a high degree of independence from the electrical grid. Many of these systems are, however, located and installed in exposed places such as rooftops, and will therefore be subjected to all weather conditions including lightning for decades. The cables of PV systems frequently enter buildings and extend over long distances until they reach the electrical connection point. Lightning discharges cause field-based and conducted electrical interference and this effect increases in relation to cable lengths or conductor loops. Surges do not only cause damage to PV systems but can also cause damage to the other internal devices inside the building. Most importantly, production facilities can be damaged easily, causing production to come to a halt. The energy released by a lightning discharge is one of the most frequent causes of fire, which makes the protection of personnel and fire prevention paramount in the case of direct lightning strikes to the building. Fig. 1: For a 10 mm diameter air termination mast, the minimum distance from the PV panel should be 1, 08 m.
The building should be assessed at the design stage of the PV system to determine whether a lightning protection system is installed or, in new structures, whether lightning protection is required. When determining the necessity of lightning protection for PV systems, a distinction must be made between installations on buildings without lightning protection and on buildings or structures in need of permanent lightning protection systems. Installing PV modules on buildings does not increase the risk of lightning strikes. The necessity for lightning protection cannot be based on the mere existence of a PV system. There may, however, be increased danger to the electric facilities in the building, should it be struck by lightning; strong conducted and radiated interferences may result from lightning currents due to the PV lines in existing risers and cable runs inside the building. It is therefore necessary to estimate the risk posed by lightning strikes according to SANS/IEC 62305 Part 2, and to take this into account for the lightning protection system (LPS) design. Measures to protect electronic system components from failure due to lightning flashes and surges are therefore absolutely necessary. The system concept of competent PV system installers should include and take into account the cost of lightning and surge protection from the outset. Surges in PV systems are caused by inductive or capacitive voltages deriving from lightning discharges and switching operations in the upstream AC system. Lightning surges in the PV system can damage PV modules and inverters. This can have serious consequences for the operation of the system and failure can result in power cuts for the operator of the structure. Surge protection devices (SPDs) installed to protect the AC, DC and data systems have proven very effective in protecting these systems from destructive overvoltages and surge currents. Fig. 2: Equipotential bonding by means of copper conductors. Structures without existing structural lightning protection systems. Structures with existing structural lightning protection systems. 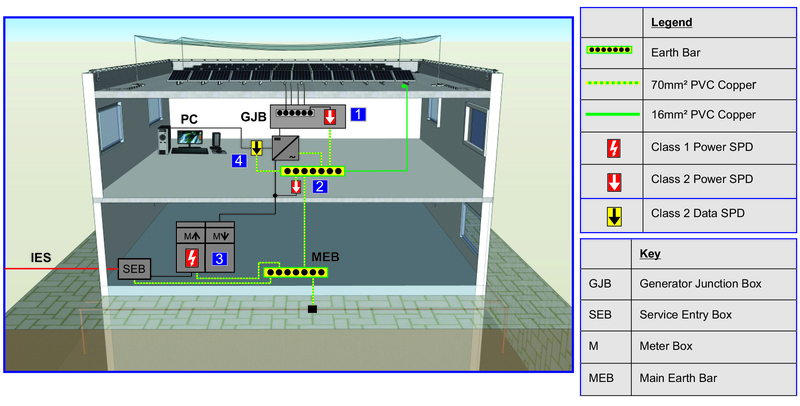 Supplement 5 of IEC 62305-3 stipulates that surge protection devices must be installed on rooftop PV systems even if the building is not equipped with a structural LPS. Cables must be routed in such a way that large conductor loops are avoided. This must be observed when combining DC circuits to form strings and when interconnecting several strings. 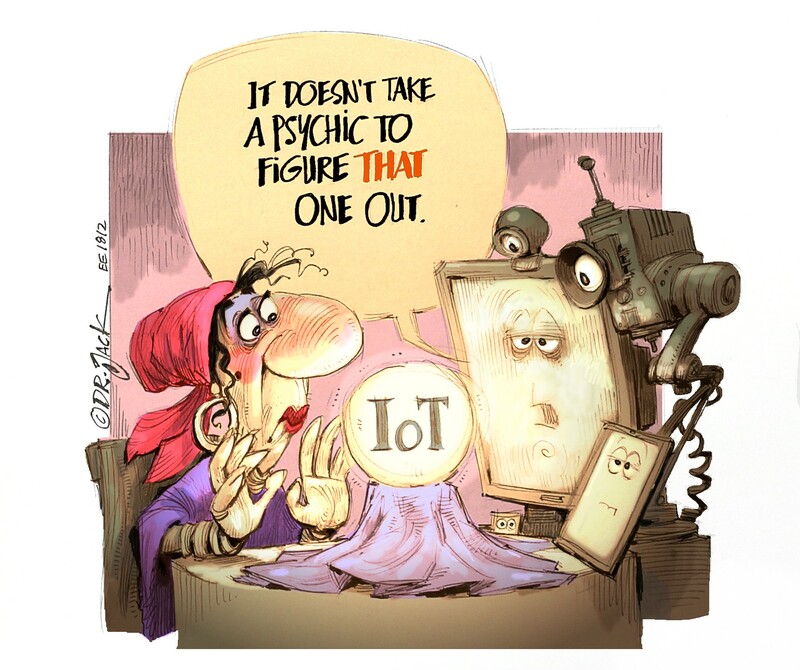 Care should also be taken with the routing of data and sensor lines. Prevention of large conductor loops must also be observed when connecting the inverters to the electrical grid. All power cables (AC and DC) and data lines must be routed together with the equipotential bonding conductors along their entire route to prevent conductor loops. PV modules are typically mounted on metallic mounting systems. The earthing or equipotential bonding of these metal frames into the LPS or the electrical earthing system (on structures without LPSs) will ensure correct bonding and earthing of the PV modules. The method of equipotential bonding depends on whether the structure has a structural LPS and on whether the separation distances can be maintained. Fig. 3: A structure with external lightning protection and adequate separation distances. 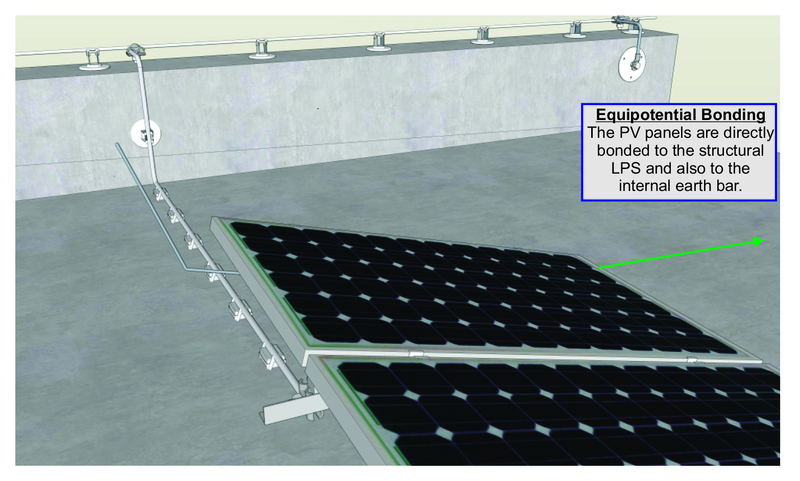 A specific separation distance, s, must be maintained between the LPS and PV system. The separation distance is the minimum distance required to avoid uncontrolled flashovers to adjacent conductive elements as a result of a direct lightning strike to the lightning protection system. In the worst case, the uncontrolled flashover can cause a fire and the separation distance concept should therefore be implemented wherever possible. The separation distance must be calculated in accordance with SANS 62305-3. The use of HVI conductors is an acceptable method of ensuring separation distances in cases where physical separation is not possible. 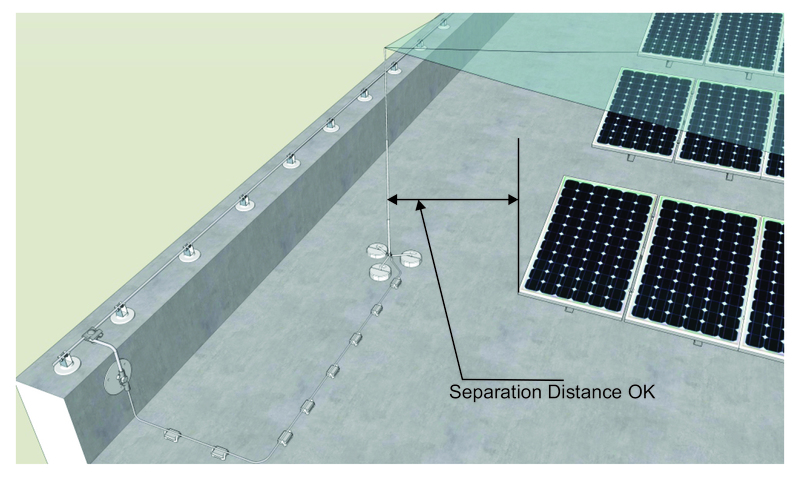 The correct separation distances between the PV panels and their conductive elements to the structural LPS should be calculated and maintained wherever possible. The distance between the PV panels and the external LPS is essential to prevent excessive shading. Diffuse shadows cast by overhead lines, for example, do not affect the PV panels or their yield significantly. Core shadows that cast a dark, clearly outlined shadow affect the PV panels negatively in such a way that they influence the current flowing through the PV panel. For this reason, lightning protection air termination masts should be installed as far as possible on the south side of the PV panels (in the southern hemisphere) and the distance of the north side air termination masts should be calculated and maintained to not affect the performance of the PV system negatively. 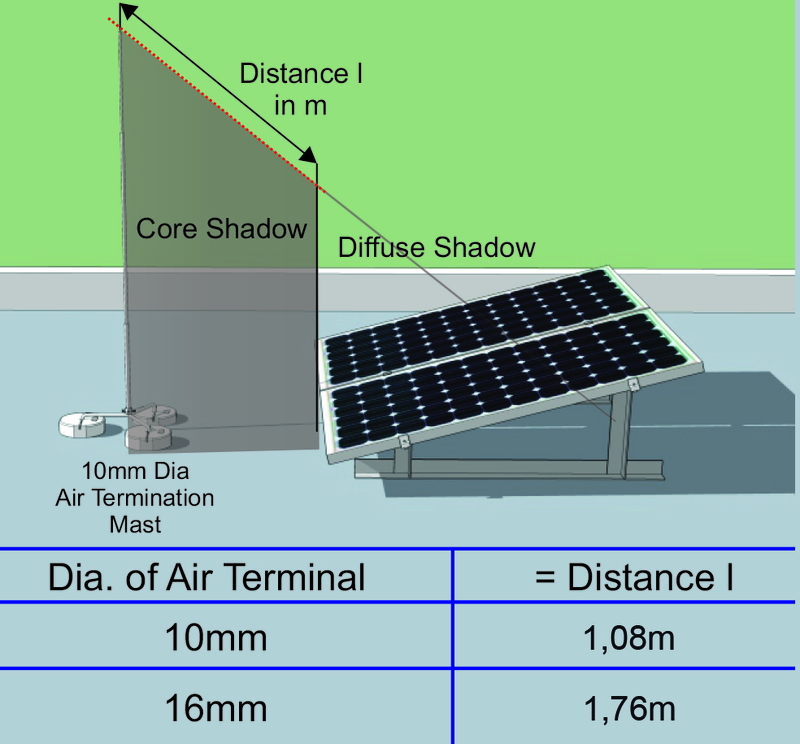 For example, for a 10 mm diameter air termination mast, the minimum distance away from the PV panel should be 1,08 m so that only the diffuse shadow is cast onto the PV panel (see Fig. 1). 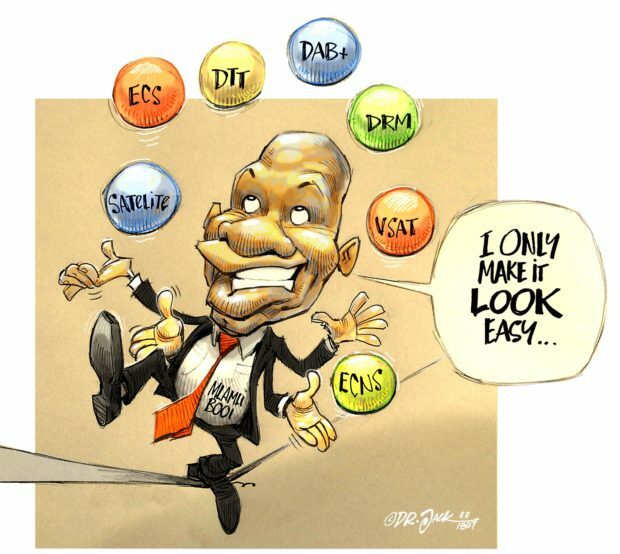 It is mandatory to carry out lightning protection risk assessments in accordance with SANS 62305-2 for new structures. Once the risk assessments are conducted, the appropriate lightning protection level will be selected in accordance with the selected lightning protection level and the lightning protection system installed to protect both the structure and the rooftop PV system. Structures without existing lightning protection systems. Structures with existing lightning protection systems where adequate separation distances can be achieved. Structures with existing lightning protection systems where insufficient separation distances are present. Surge protection to the PV system by means of Class 2 and 3 surge arresters. Equipotential bonding to the electrical earthing system by means of 16 mm² copper conductors (see Fig. 2). The existing structural lightning protection level should be verified by an inspection of the lightning protection system once the structure has been assessed and the presence of an existing structural lightning protection system confirmed. The inspection of the existing lightning protection system should also verify that the LPS is intact, fully functional and in accordance with SANS 62305 Part 3. Any defects should be rectified to ensure that the lightning protection system for the rooftop PV system will work properly. The inspection and verification of the existing LPS, as well as the lightning protection design for the rooftop PV system, should be performed by a lightning protection specialist. The lightning protection system shall be installed in such a way that the PV panels are not vulnerable to direct lightning strikes. The method of protection of the rooftop PV system is via the air termination system with the preferred protection methods being either the angle of protection method or the rolling sphere method of protection. The size of the sphere and the size of the angle of protection both depend on the applicable lightning protection level. Fig. 5: Calculate the separation distance to prevent uncontrolled flashover. If possible, an isolated lightning protection system should be installed where the calculated separation distances are maintained. 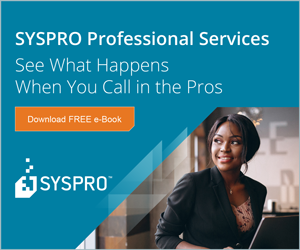 Isolated LPSs are far more effective than non-isolated systems. If the installation of an isolated lightning protection system is not possible, the installation of additional Class 1 lightning current arresters on both the AC and DC sides at the inverter boxes is required. The designer of the lightning protection system should also consider which method of protection will be more economically viable. LPS in accordance with lightning protection level. Surge protection by means of Class 1 lightning arresters and Class 2 and 3 surge arresters. 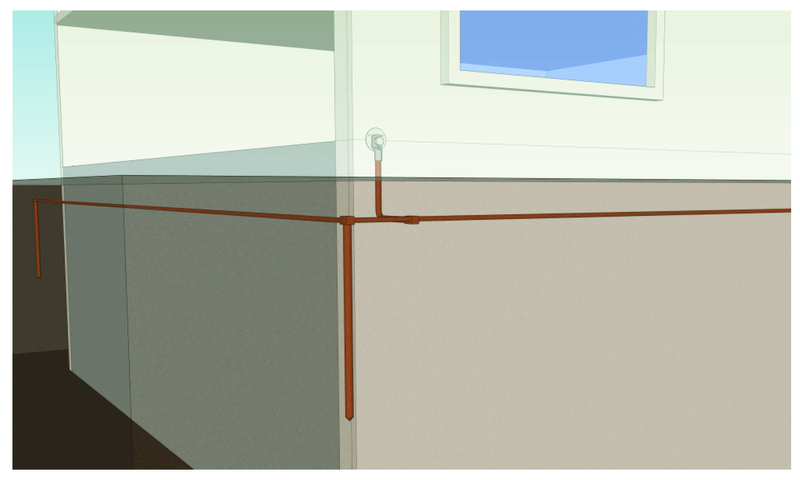 Equipotential bonding by means of 16 mm² copper conductors to the earth bar only – no bonding to air terminals. The primary protection goal is to prevent damage to the structure (by fire) and injury or death to persons resulting from direct lightning strikes. The PV system must be protected from direct lightning strikes. This means that the PV system must be installed within the protected volume formed by the external LPS. The protected volume is created by the installation of air termination rods and the rolling sphere or angle of protection methods are used to calculate the height and placement of the air terminals. Establishing the correct separation distance prevents partial lightning currents from entering the building and electronic equipment via the PV system’s cabling. Inverters and data systems are protected by means of Class 2 surge arresters and not Class 1 lightning arresters. The overall cost of the lightning protection system is therefore reduced and the installation is in accordance with the preferred method of protection (see Fig. 3). The bonding of the PV panels is carried out at the internal earth bar only. No bonding to the LPS is carried out for an isolated LPS (see Fig. 4). An isolated LPS is achieved by maintaining a calculated separation distance between the LPS and PV system. The separation distance calculation depends on the lightning protection level, number of down conductors, isolation material and length of down conductors to earth (see Fig. 5). The separation distance must be calculated to ensure that no uncontrolled flashovers occur. In accordance with SANS 62305-3 there are two types of earth termination systems. Type A consists of individual earth electrodes and Type B consists of ring type earth electrodes. For structures that have sensitive electronic systems, Type B, ring type earth electrodes are recommended. Ring type earth electrodes fully encircle the structure with a buried conductor as shown in Fig. 6. Fig. 6: Ring type earth electrodes encircle the structure. Equipotential bonding by means of 16 mm² copper or 50 mm² aluminium conductors. When the correct separation distances cannot be establishment, PV systems are vulnerable to partial lightning currents. The protection of inverters and data systems is therefore done by means of Class 1 lightning arresters and not Class 2 surge arresters. All the PV lines entering the building from the outside (i.e. roof) must be protected by means of Class 1 lightning current arresters in accordance with Supplement 5 of IEC 62305-3. In many cases, rooftop PV systems are installed on top of steel roofs, where separation distances cannot be maintained due to the type of structure. All the metal components of the PV system must be bonded directly onto the external lightning protection where the separation distance cannot be maintained. 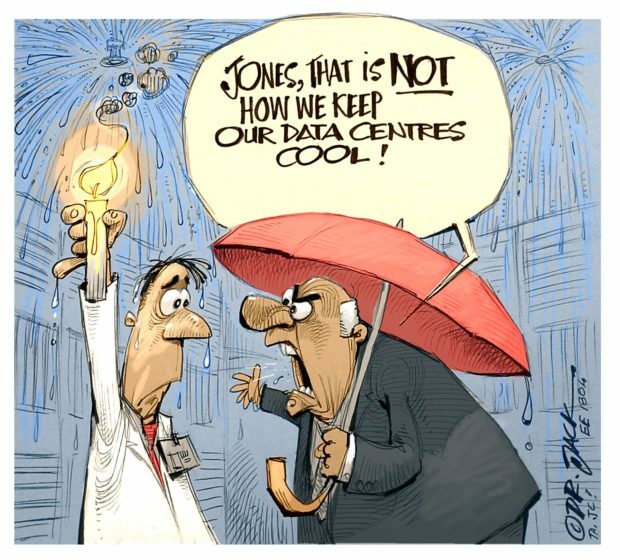 It remains imperative that an air termination system be installed to protect the PV system from direct lightning strikes to provide controlled interception and dissipation of the lightning current. Fig. 7: PV panels bonded directly to the LPS. 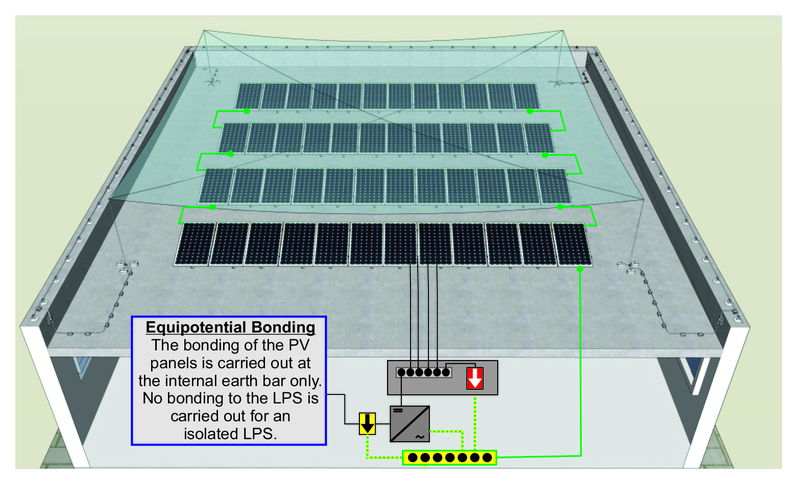 The PV panels are bonded directly to the structural LPS and also to the internal earth bar (see Fig. 7). 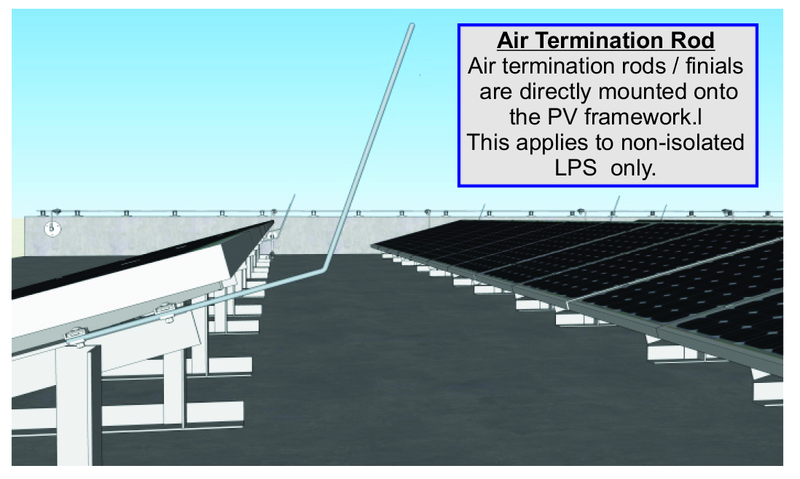 Air termination rods or finials are mounted directly onto the PV framework. This applies to non-isolated LPSs only (see Fig. 8). Fig. 8: Air termination finial. Solar power generation systems are an integral part of today’s electrical systems. 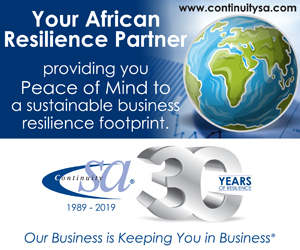 They should be equipped with adequate structural lightning protection systems, lightning current arresters and surge arresters, thereby ensuring long-term faultless operation of these sources of electricity.